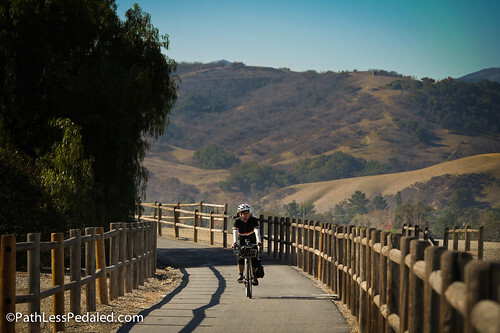 The Ojai Valley Trail is one of the hidden bicycle gems in Southern California. We are going to let you in on what has to be one of our favorite short bike tours in the Los Angeles area. 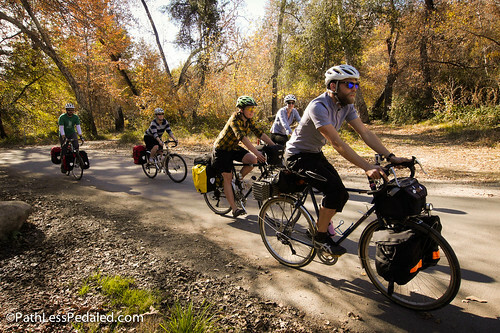 Because a majority of the ride is on the wonderful Ojai Valley Trail (one of the Southland’s best undiscovered bicycle gems), it is both a great beginner and family-friendly bike tour. The trip begins in the coastal town of Ventura, which has a surprising number of bike lanes for a city that isn’t generally known as a bikey town. It has a cute historical downtown, which seems to be undergoing a slow redevelopment. Our new favorite spot to eat on Main street is Taj, a reasonably priced and exceptionally delicious Indian restaurant with a great lunch buffet. Ventura is also home to the outdoor clothing company Patagonia, which gives occasional tours of its offices and lets you peek into the tin shed where Yvonne Chouinard created his first bits of climbing gear. One of our favorite aspects of this trip is that the beginning of the ride can be accessed by train (Amtrak Surfliner). If you are able to get to Union Station or any of the stops along the coastal rail routes, you can get to the start of this ride without driving. Our friends that joined us began their trip in Santa Monica and utilized the new Expo Line to get to LA’s Union Station. From there, they hopped on the Amtrak Surfliner. 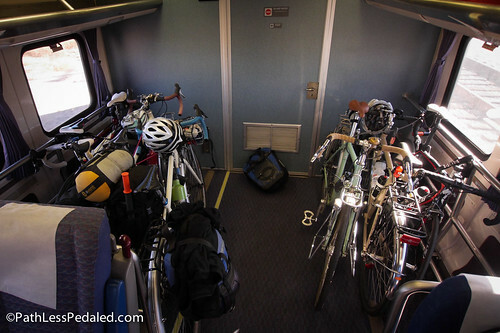 The bike area on the Amtrak Surfliner. Make sure to book your free bike reservation so you have a guaranteed spot on the train. Waiting for the Surfliner at the Burbank Airport station. From the train platform in Ventura, it is a short ride to the beginning of the Ojai Valley Trail (also known as the Ventura River Trail). During the first few miles, you pass through a post-apocalyptic industrial zone, which is both eerie and cool at the same time (the trail snakes beside some of the previously most productive oil drilling land in the US, now mostly abandoned). After a few miles, you cross a creek bed (which was recently really dry) over a beautiful humped wooden bridge. From here on, the riding grows more scenic, as you pass beneath tree cover with great views of the valley to your left. The trail does climb, but it is generally a mild railroad-type grade, which is rideable by almost all fitness levels. If you need to take a break along the way, Foster Park can be accessed right off the trail and has restrooms and water. Another great feature about this ride is that it offers options for both camping or staying indoors. On our recent visit, we did a little bit of both. The first night, we camped at Lake Casitas, which you can reach by taking a quiet country road off the path. This on-road detour does involve some additional climbing but it’s nothing too severe. Lake Casitas is a reservoir, meaning that you can fish and paddle a boat, but you can’t swim in it. Thankfully, there is an onsite waterpark for that. 🙂 During summer months, the campground can be a bit of a zoo, but in “winter” it is a ghost town and you’ll have the camp ring almost to yourself. “Winter” camping at Lake Casitas. The easy and relaxed riding makes this a great first tour. Bring your friends! Another awesome camping option (which is even LESS well-known) is Dennison County Park. To get to Dennison, you have to pass through town to the East, and ride up Dennison grade (a fairly moderate 2-mile climb, but nothing extreme). Dennison County Park is truly a hidden gem. Certain campsites offer sweeping views of the surrounding valleys, and a short steep stretch of road in the park separates tents from RVs. It has bathrooms (no showers) and potable water and is looked over by a super friendly camp host. He was even kind enough to offer us a pack quilt because the temperatures were supposed to dip into the 30s. We highly recommend this campsite! The campsite at Dennison County Park, one of the great undiscovered camping opportunities in Southern California. If you are biking with kids and want to avoid any road riding, you can take the Ojai Valley Trail directly into town. As a caveat, there is a very confusing unmarked section where you pop out abruptly into the parking lot of a strip mall and the trail appears to end. It DOES go further, but you have to cross the street to the right and go through a park. Once you make that connection, the trail continues through the entire length of town, paralleling the main street, with shops and restaurants a few blocks away. A non-descript door along the trail leads you into the Ojai Rancho Inn. 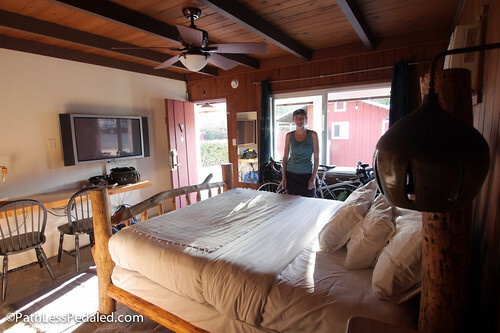 A great indoor accommodation which actually has a rear entrance to the trail is the Ojai Rancho Inn. We were tipped off to this place by one of the guys at The Mob Shop, the local bike shop. An older, motor inn style property that was recently purchased and renovated, it’s now a hip bike-friendly haven. The rooms are simple with a lot of wood paneling, but are furnished with new flat screen TVs if that’s your thing. There is also a pool and sauna on property, and morning coffee is served at the office out of large Stanley thermoses. The folks who checked us in didn’t bat an eye at the idea of us taking our bikes into the room with us, and there are also cruiser bikes for loan. Rough it or enjoy a little country comfort. Ojai itself is a quaint town, with a main street lined with restaurants and western boutiques. It also has an amazing farmer’s market which is not to be missed. Rainbow Bridge is a local market that focuses on natural and organic foods, and has a hot bar and deli. 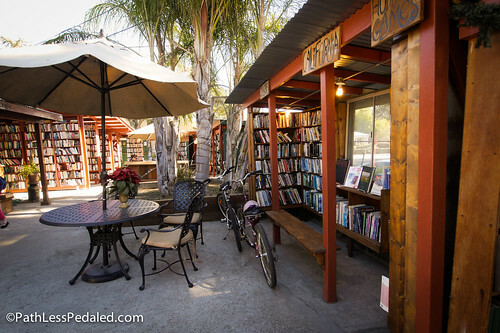 One of the other unlikely things you’ll run into in Ojai is Bart’s Bookstore, which is an outdoor bookstore! It is something to see for yourself, but large portions of the bookstore are sans roof, which makes it a great place to relax and read in the middle of a hot day. They are also bike friendly and will allow you to wheel your bike inside the outside (if that makes sense). An outdoor bookstore isn’t something you encounter everyday. 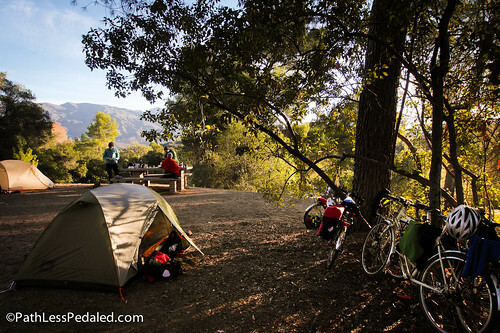 Once in Ojai, you can treat it as base camp for a few days and do some of the other amazing rides in the area. One local favorite is Sulphur Mountain, a mixed terrain ramble on a car-free “road” that is open only to bikers and hikers. For those that like to climb, the ride up to Pine Mountain is nothing short of epic. We rode down it years ago (coming up from the opposite side) and descending into the Ojai Valley took our breath away. For more ride ideas, stop at the The Mob Shop, located at the site of a former gas station (which was creatively renovated a few years ago). At the shop, you’ll find a bakfiets and Yuba Mundo parked outside, and everything from mountain bikes to road bikes inside. The owners are super friendly and are a wealth of information about riding in the area. 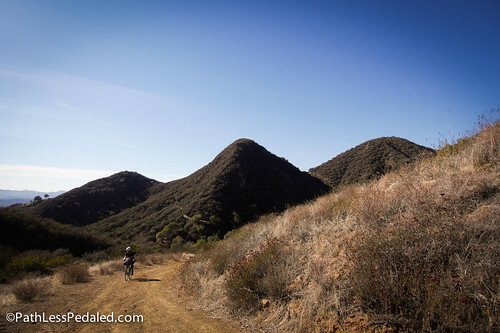 Lots of opportunities for epic rides and mixed terrain in the Ojai area. Once you are done exploring the Ojai area, it is practically all downhill back to Ventura! This is really one of our favorite tours in So Cal, and it’s suitable for a wide range of riders and tastes. So if you live in the greater Los Angeles area and want to dip your toes into touring, forget the loud and busy coast and head for the hills of Ojai instead. *For a family friendly version, continue on to Ojai via the Ojai Valley Trail and avoid the spur to Lake Casitas. I’ve ridden the Ojai Valley Trail a few times. It’s always a delight. We make a morning of it … ride to Ojai, stop for a good cup of coffee, check out a couple of galleries, then back down the gentle rolling trail to Ventura. Thank you so much for posting this! My family and I thought we biked everywhere in soCal, but this ride is indeed a hidden gem! Beautiful Photos! Do you remember your site number at Dennison? Love that view. A small group of us came down the coast earlier this week. We found out Dennison was iffy on water as it’s on a well. The County suggested Camp Comfort which turned out to be a delight. 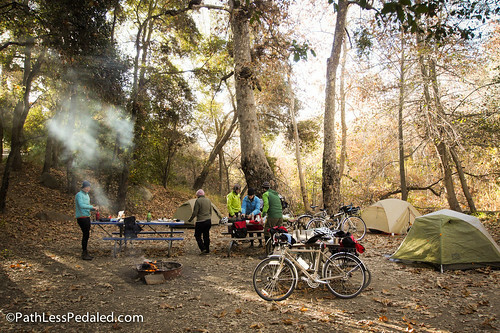 2 miles south of Ojai on Creek Rd, it’s small, only 15 spaces but does have showers & laundry. Camp Host Stuart has detailed history of the camp as well as Ventura County in general. Highly recommend this spot, esp. if it’s the end of a long day. In the AM we got coffee & a few miles warm-up before hitting Dennison Grade. Thanks for this great writeup. I’m local in the Ojai Valley and not currently biking, but my late sister Barb Brown in Idaho Falls ID biked avidly for the last 30 years of her life. In fact she formed a group of bikers aged over 50 called “The Geezers” and mapped a route of 20 or 30 miles for them to ride ever Tuesday morning, spring, summer and fall. By her passing in 2017, there were 50 of them, of whom 20 rode on a regular basis. Others continue to manage it and they’re about to send out their first post for 2019. I’ll send them your URL, hoping for a visit from one or more of them to an area where the biking is good all year round! Definitely hope to come back. We’ve only just scratched the surface of the riding there!